Description: Looking forward as these elderly engines wait for their turn to show that they still can make it up the hill. Description: LAUMIS (LM) is making a set out at Garrison. Description: MISLAU (ML) glides down into Helena after tackling Mullan Pass. Description: LM is westbound from Garrison. Description: 2 SD45 helpers wait for the signal to head back light to Helena on a frigid September afternoon. Description: When I first started railfanning, the traffic was not as bad on O'Rea Creek Road. With the growth in population in the Bozeman/Livingston area what once was a quiet and serene road is turning into well-traveled thoroughfare. Thus, safer crossing devices to warn cars at blind crossings like this. Description: MRL 331 brings up the rear of the set of SD45 helpers that returned on this Sunday to help assist the Helper 1 crew running the SD70ACe's that had helped a coal load summit the pass earlier. 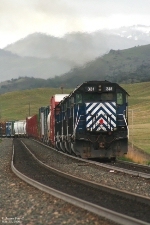 Description: MRL 331 helps the LM up Bozeman Pass. Description: Nothing beats a set of 4 SD45's in run 8. Description: Seven MRL units head light back to Helena to shove something else over Mullan Pass. Description: Parked power waiting for service.